Business is bad at the diner. The risotto food poisoning incident put all of the customers off eating there, which isn’t surprising. Marilyn was given the day off due to lack of customers but decided to go the whole hog and handed her notice into Irene. Things are so bad that she’s considering closing the diner. That should work out well for Angelo’s given it’s the only other eatery in town. Brax displayed remarkable parental skill with his new nephew Harley. Ricky was dead impressed but still didn’t feel like revealing her miscarriage to him. She had a change of heart after talking to Casey and decided to tell him what happened, he was suitably shocked. Brax went to confront Andy about the photo and denied knowing what it was about. Andy told Casey he’s leaving the gym for a while, where’s he off to? It must have something to do with the photo. Sasha took Matt around to her place and tried to cheer him up but he just wanted to get it on. Sasha suggested playing poker and things got flirty so she told him to cool it. He rejected her help and said that she had screwed things up for him by recommending sending his sister away but then he returned and apologised, now they are bestest buds. I’d say Sasha and Matt will be doing a line before long. Jess is still hanging around and this is causing problems for Heath and Bianca. She wants him to be an active parent but that’s more than he can offer. He asked Jess to leave town so that he can get things back on track with his wife. He met her on the pier to tell her but she got a baby kick and duped him into feeling it. Bianca spied all of this and wasn’t impressed, she’s off to the city for a few days as a result. Chris is feeling a lot more positive about his situation after a talk with Irene. He tried to invent a new burger for the Diner menu which Irene shot down but she is going to try to set him up with somebody, maybe Tamara. She’s roped Leah into her cupid caper. Irene got Chris to have lunch with Tamara in the diner, by telling him that she was into him. It backfired spectacularly as she hates Chris. Kyle is struggling to come to terms with Phoebe’s ultimatum – to hell or to Melbourne. He told her that he can’t leave the bay due to his commitments and they are many. What would the town do without its local restaurant manager, part-time busker and kidnapping consultant? Maybe his bro can fill the gap as who walked into Angelo’s only its owner, Daryl “Brax” Braxton. He knocked back a shot and we all know that says he means business. The Bay had better watch out, the boss is back. 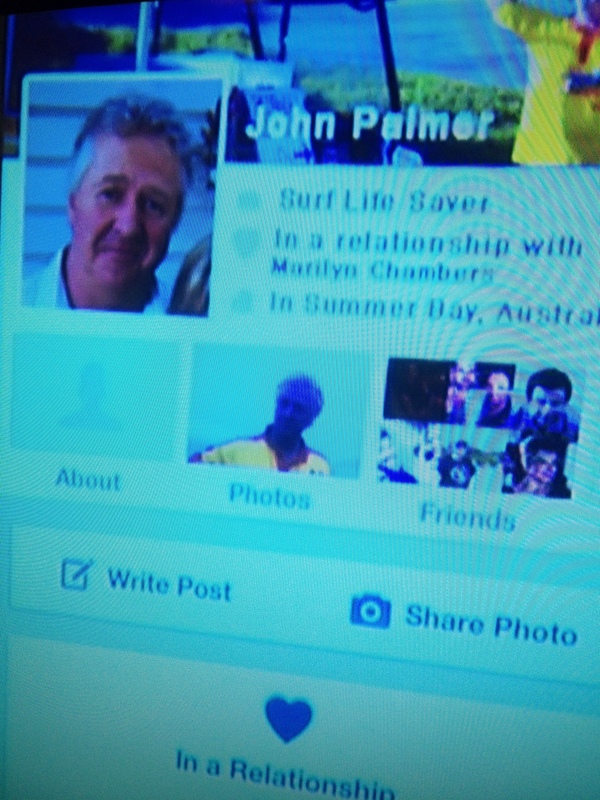 The grown-ups in Summer Bay are fierce down with the social media lingo, they were throwing the acronyms around like there was no tomorrow. Not only that, but John and Marilyn confirmed their relationship on Facebook. In other news, Chris misses Indi and Kyle and Phoebe are in l.o.v.e. Kyle to reveal kidnapping kink? Phoebe is putting pressure on Kyle, trying to get him to lessen his involvement with The Boyz. She’d never have lasted in the good oul’ days, when they were dealing and bashing daily. He is hiding his weirdo past, but she’s threatening to leave unless he ‘fesses up. Irene’s date didn’t show up because of transportation issues. NEXT! Case and Rick went to the clink to visit Adam and ask him to help Brax’s case. Adam was reticient; it means he’ll get more time in jail. I have to admit, I thought we’d never see him again. Bit mad that Ricky still hasn’t told Brax about the baybee. So Heath’s buck’s night barmaid is up the duff, and Bianca is none too impressed. That’ll pass though. Our money’s on a Braxton adoption. Sasha bowed out of the captaincy race at the last minute, and non-candidate Matt won the male contest. Perhaps he and Tamara could become an item. It has been commented that he is an Aden-type character, so he’ll probably come good in no time. There was some amazing line-crossing between Marilyn and John, in which she thought he was going to propose, when really he was trying to source a beau for Irene. Ah bless. Casey and Ricky are off to visit Adam, and plead him to help Brax’s case. Caution advised. Harvey said a very long goodbye to the Bay today. They all got over it and let him leave, even Spencer who was having a hard time adjusting to his impending departure. As a consequence, Maddy was spending a lot of time with Spencer, causing Josh to go green with jealousy. He gave her an ultimatum but she opted to stick with Spencer et al, so that’s it, they’re done. Chris is going to try and become a matchmaker for Irene. He wants Johnny boy Palmer to help him, but John is reluctant. I’m inclined to agree with John, arranged dates don’t usually end well in the Bay. Sasha and Tamara are at loggerheads over the school captaincy. Tamara is counting on the Mangrove River vote but Andy told her that she’s barking up the wrong tree there, those students won’t bother voting. Tamara made friends with Phoebe over a beer in Angelo’s, then had a go at Sasha who was there for dinner. Tamara may have the superior policies but Sasha has the advantage of promising free ice cream, that could clinch her the election. Sean spent the episode throwing his weight around, trying to intimidate and kidnap half the bay. He had Andy cornered in the caravan park and was starting to bash when Casey turned up at the head of the Boyz, it’s great to see the old gang back together. Casey managed to face him down which saved Andy’s bacon. Kyle got the hump that he wasn’t invited along for the gang war so he met Sean later and brought him to Angelo’s, trying to pay him off. Sean was ungrateful and didn’t accept Kyle’s offer of a payoff to walk away. He swung but clearly didn’t realise who he was messing with, Kyle made dirt of Sean, and kicked him out of his blood stained restaurant. When Casey turned up asking after Sean’s whereabouts, Kyle pleaded ignorance, saying he had no idea where Sean had got off to. A short while later he turned up in Irene’s. Bashed, bloody but unbowed, he still found time to threaten and intimidate a few more cast members, namely Irene, Sasha, Spencer and Chris. He has them prisoner in their own home now, which is lovely and tidy after the slave labour the kids have to put in for partying too hard in Irene’s gaff. Harvey is still trying to figure out who he is since he returned from his ordeal. He spent the night outdoors, sleeping rough under the stars. I wonder if he would like a go at Sid’s ditch, it’s free now the good Dr. has left town. Bianca is still in a coma in the hospital, with Heath at her side waiting for her to come to, which she did at the end of the episode. Himself and Irene explained what had happened which she had problems understanding, her short term memory seems damaged. It was handy Heath was in the hospital as Nate was able to let him know that Ricky had been admitted to the hospital with baby issues. He did a scan on her and she had lost the baby. I wonder if she’ll let Brax know about it now? Phoebe is still hanging around the bay, sleeping in her car and stalking Kyle. She tried it on with him, again but he is able to resist her charms somehow. She thinks he should come back to the rock and roll lifestyle but he says he’s happy in the Bay being a restaurant manager. She wasn’t happy with his answer so she went to Tamara for a chat and told her to cut off all contact with him. Tamara went to Kyle and they agreed that everything is ok between them, they can continue to work together and be mates. Chris and his new regime in the diner is driving Leah around the bend. Apparently he is an organisational genius but Leah can’t handle it as it’s not he way she used to do things. She reached the end of her tether and told him to sling his hook. Chris had to crawl back to Leah with his tail between his legs and apologise, he agreed to let her run things her way, fight your battles mate.